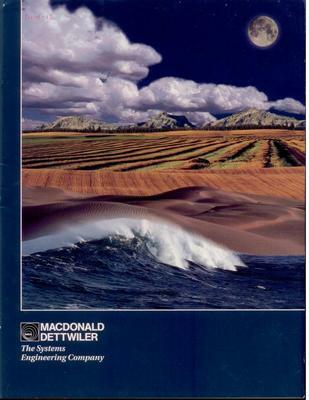 The Brochure is made by the Macdonald Dettwiler Company. The brochure details about the growth of the "World Community" and how many industries are becoming more reliant on technology and computers. The brochure details and describes how the company applies technology in many different industries such as Space Tech, Meteorology, Aviation Earth Observation (Satellite Imaging), Defence, Systems Engineering.